Sydney beaches are beautiful, but as summer rolls in, finding a spot among a sea of bodies is becoming a difficult exercise. 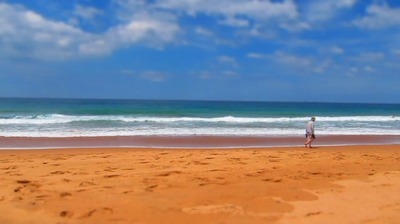 If you like your beach experience to be relaxing and not confining or confronting, head down to the Northern Beaches' best kept secret - Mona Vale Beach. Located in Sydney's north, Mona Vale beach is a sprawling stretch of sand and surf framed by two grassy headlands in a quiet suburban area. 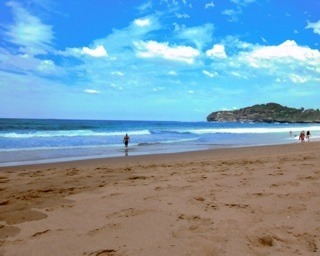 Stroll down to the south end of Mona Vale to feel like you have truly escaped the city. Hand Gliders soar above your head and surfers play in the waves below while you walk almost isolated, taking in the sea air. Continue further down the beach and play among the rock pools and laze in the looming shadow of the headland, or climb up the headland and take in the vast Pacific from a viewing platform. Mona Vale Beach is one of the few remaining beaches with unlimited free parking still available at the south end, another draw card for this peaceful haven. Back at the North end of Mona Vale you will a male and female toilet and shower facilities, picnic tables, electric BBQs and just back from the beach cute little cafes. Perfect conditions for a day out with family and friends with no worries but what togs to wear.